When a photograph is taken, a voice is recorded, or a video is captured, there is a duplication that occurs. One memory is stored internally in the body to be reconstituted later while the other takes a physical form and enters into the archive of memory objects. It is the relationship between the two forms—one living and malleable, the other rigid and enduring—that my work takes as its subject. The space that exists between these two forms is charged by the politics of identity, the clash of past and present, and the slippage between invention and record. In aggregating personal and institutional memory object archives we have constructed shared narratives of self, family, and community that are marked by a frozen, excerpted sense of completeness. Biological memories, however, as suggested by recent studies in memory science, are far more incomplete and mercurial—subject to revision each time we revisit them. In my work I bring memory objects into the digital environment as a way to introduce aberrations and imperfections that complicate and interrogate the construction of these narratives. For the larger photographs that are part of the series Still I start with fifteen to twenty images of the landscape. I overlap the images and then build pieces to connect them visually transforming them into one seamless image. The next step is to build new pieces of the landscape to cover the figures and create an empty space. Then I look through the photographs from that site to find figures that would work in the image. I copy and paste each figure and then isolate them from their background by creating a mask for each figure. When I find a figure that works in the space I rotate them and then create a shadow for them that anchors them to the landscape. In Consumption I start with an image and then create a custom mask to remove the bodies of the children and husband from the image. After the mask is created I fill in the hole that is left with pieces that I have copied from other parts of the photograph. In some images I have to build an entire couch from a small corner of a couch. In each image I try to imagine what would have been behind the body and then I create it slowly from little bits of the photograph. 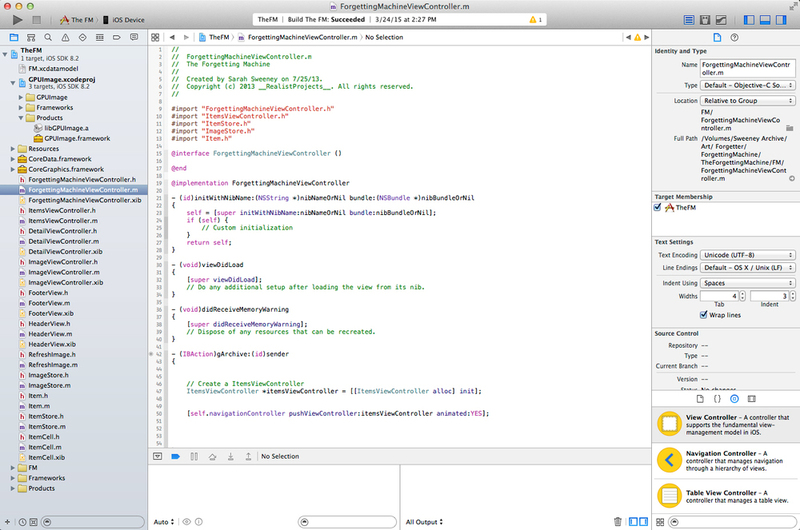 To create The Forgetting Machine I learned a new coding language, Objective C, and the Interface Builder in xcode. For each one of the actions in my app I wrote a function and then connected it with the pieces of the interface that I made in Photoshop. I have had to update the code twice to accommodate changes in the operating system and new hardware.